There are many illegitimate Disney World Facebook pages online—even calling themselves “official,” and administrators of these fake pages make posts about entering a contest to win a trip to the parks by “liking” their posts and “sharing” the posts on your own Facebook page. Since these pages are fake and in no way affiliated with the Walt Disney Company, liking and sharing will most likely only lead to your demise—your Facebook account and friends list may be hacked. 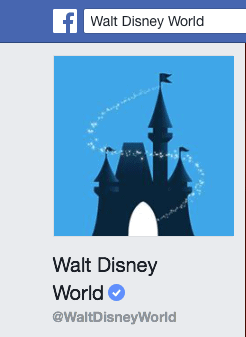 The only truly official Walt Disney World page has the title “Walt Disney World” and a blue circle next to it with a checkmark in it. It also has close to 20 million likes and 15 million users following the page.